is written entirely in SQL and runs in the browser . 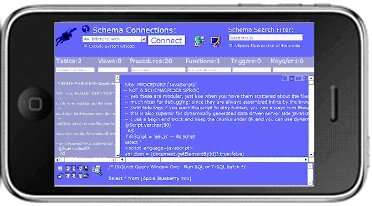 . .
You can access any schema element instantly on screen at once. You can drill into, edit and rebuild any object with one click. You can filter the entire database view on a field name or code fragment. You can edit a stored procedure alongside a copy of itself or any other procedure with one click. You can drag blocks of SQL back and forth from anywhere or execute them ad-hoc. You have several immediate code windows you can navigate with a single click. You can easily morph the IDE in terms of screen real estate; forget docking 30 tiny little controls into the environment, you can dock the environment into the target control. You don't have to watch the hourglass. And if you're running the IDE on hardware that's really old (like a 300 MHZ NT4 or Windows 2000 box from 1998 running SQL Server 2000) you still don't have to watch the hourglass. Some illustrated screenshots of the SQL Server IDE follow with more information; the last shows a Relational Web Application being launched (in addition to all kinds of SQL Server development, the IDE of course lets you build Relational Web Applications). 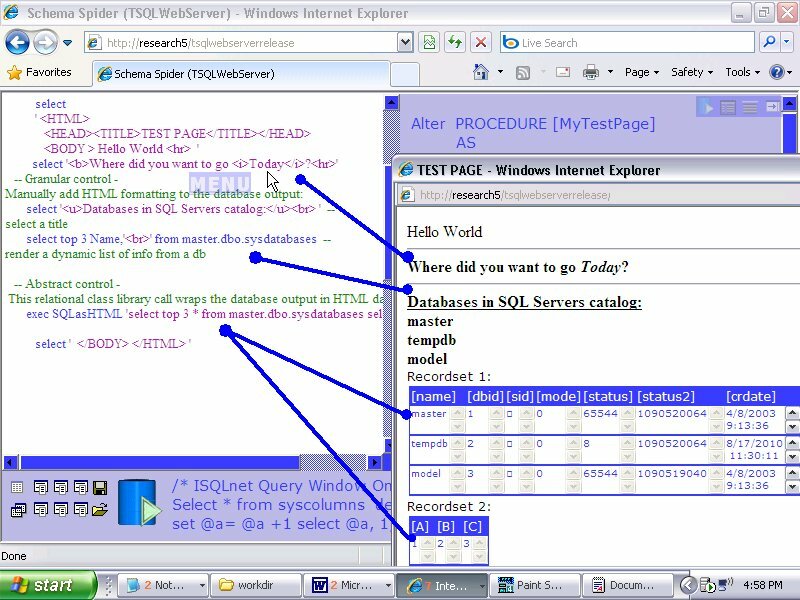 In the screenshot of the IDE above, the Developer is working with the Stored Procedures collection on SQL Server; this IDE can connect remotely to any SQL Server anywhere in the world, but because this SQL Server IDE is written entirely in SQL, it happens to be connected recursively to itself and the developer is editing one of the dozen stored procedures that comprise the IDE. In the screenshot above, the Developer is working with the Stored Procedures collection and has docked the environment. Since this stored procedure happens to also be a relational web application, the developer has launched it in the inset window; the lines illustrate straight through granular content from SQL Servers raw Tabular Data Stream and an abstract SQL call to a relational class library. In the screenshot above, this Developer is running the IDE on his iPhone; he can write code on the go, anywhere: in the rain under an unbrella, at the gym, shopping in a grocery store or while waiting for the bus or even crossing the street. With an iPhone or Droid the IDE goes anywhere the developer goes; work anywhere all the time with complete mobile development. SQL Server 2000/2005/2008, SQL Server, and Microsoft are registered trademarks of Microsoft Corporation. Transact-SQL is a trademark of Sybase, Inc. 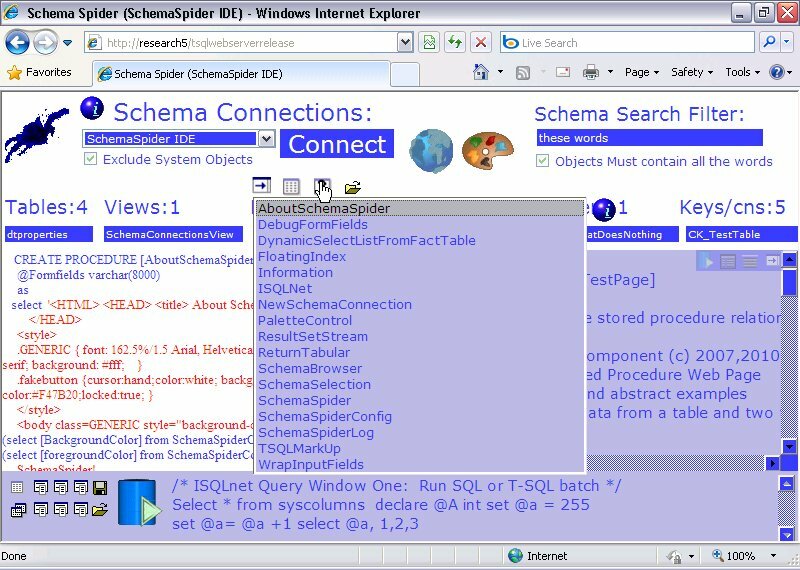 The Relational Framework and the SchemaSpider IDE for SQL Server are © 2004,2007,2010 RelationalFramework.com.